Home Android Games 8 Best Android Horror Games | Face Your Fears!!! 8 Best Android Horror Games | Face Your Fears!!! Best Android Horror Games is here to help you conquer your fear of always being afraid of the dark? 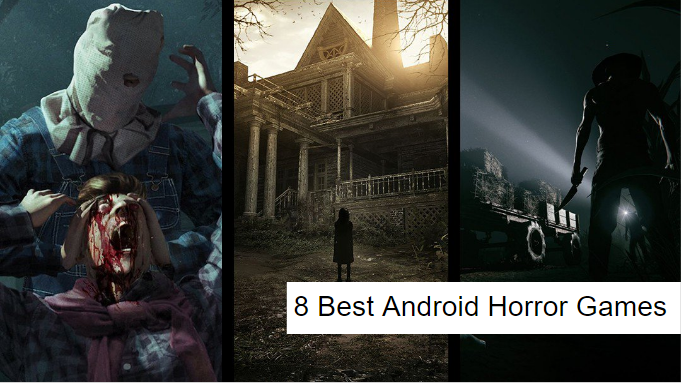 In order to stop been scared of the dark, you need to face your fears, well then, my list of the top 8 Best Android Horror Games out there on google play store has a whole lot of scary gameplay to help you get rid of that fear. Now, someone would think that it is absurd to have a horror game on your Android device, but I can tell you that the horror games that I have seen on the google play store are totally amazingly scary, Hahahahahah, I know right? amazingly scary is the word I choose to describe how totally cool these games are. So without further Ado, let me begin listing all the top 10 Best Horror Games that I was able to compile together and I want to add that horror games are not suitable for children under the age of 13 years, but horror games can be played by young ones form at least 13 years and above, anyone can play horror games on Android even old people, but the ones with heart problem, Hmmmm. So let’s go. In a hospital that is haunted by ghosts and all manner of scary beings and things, your objective, based on the storyline, a young girl is going through hell with nightmares and horror dreams and she doesn’t know what to do. Now, there is only one thing to do, face your fears, so basically, she has to overcome her fears and survive through the paranormal activities that take place in this hospital. Tension everywhere, she has to conquer that fear, by all means, so she can stop having those nightmares and sleep well at night. Your mission, if you choose to accept it, is to survive. That is basically the only mission at hand for you, so play like your safety depends on it. Unique gameplay and detailed graphics make this game to be the number 1 horror games on my list of Best Android Horror Games. This game is 43mb in the installation size. Okay, this is one of the scariest horror game on google play store right now, full on crazy scary! You will be totally thrilled about how amazing this game will get, just download and play and testify. The game is just 46mb in the installation size. Keep yourself busy with action, fast-paced intense horror games like this. Randomly occurring activities and events are just on the extreme in this game, it is literally impossible to predict the movement of your enemy in this game. So the least you can do, or I’ll recommend you do is to go with the flow, just step by step gameplay, follow your enemy and try to complete your objectives. Your objective in this game is simple, escape from the haunted house, find weapons that can be used to break and destroy the blocked doors that might be harboring your key to escape. Once you have gotten the key, find the escape door as fast as possible and escape. Explore a lot of scary rooms in this horror game on Android, If you ain’t scared, then you haven’t started yet. In the night when there are peace and quiet, break into the big mansions, but then you just discovered that the mansion is haunted with a lot of scary ghosts and terrifying creature, now you have to run for your life and escape this terror of a mansion. The thing that brought you to break into this mansion in the first place was your thirst for treasure, all the riches that are hidden in this mansion can be yours if only you can overcome your fear and scale through the mansions unafraid. The horror that lurks in the dark is going to try and haunt you to scare you and keep you from getting what you came for. Be resilient, be focused and you will succeed in your adventure. some of the cool things about this game are the fact that you can choose your own monsters and create your own audio and visual. This game is 99mb in the installation size, so approximately 100mb worth of Data for you to download. When it comes to horrible horror games for Android Sinister Edge can be rated among the top 10, because it is one of the scariest games out there on google play store. Like most horror games on Android, there are a lot of tricky puzzles in this particular horror game. So get ready for an adventure like no other. This horror game supports an external controller which is just sweet. The fun just keeps getting better and better. Amazing graphics and smooth gameplay that will literally blow your mind away. Some people are not fond of horror games, but my list of Best Horror Games For Android has the best educative and adventurous games that you might ever see. Now, to add to that, you can also use a VR headset to enjoy this game further, isn’t that cool? This game was actually made for VR headset, so get one and keep the fun going. The controls are easy, use the VR joystick to move around, look at an object to use or interact with it. This game is just 96mb in the installation size, so click on the download link below now and play. This game has the ability to make you truly afraid, no matter how strong-willed you think you are, You will experience true fear with True Fear: Forsaken Souls I. A fun-filled adventure awaits you in this game, Your objective, search for your sister, uncover the secret behind your mother’s death in the game and evade and escape the darkness that won’t stop following you. You have a map that will guide you through, so use the map and travel faster to evade the darkness. There are more than 20 puzzles to be solved, so get busy. So many achievements await you for solving each of the puzzles, over 40 of them, so there is no dull moment. This game is just 40mb in the installation size. Who doesn’t like clowns, everybody like clowns, there are funny, hilarious, cute with amazing costume and the rest, but not this particular clown. This horror clown is out to get you and torture you and then kill you. You need to escape his clown clutches and survive. The house you have found yourself is haunted by ghosts, monsters, evil spirits and the evil clown that is out to eat you up. Addictive gameplay with amazing graphics and cool audio. A lot of head-cracking puzzles that you have to solve to get away step by step and free yourself. Keep your eyes open for clues, a hidden object of interest and keys to unlock certain doors. This horror game is 60mb in the installation size. Looking at the name of this game, ‘Granny’, in your mind you’ll probably picture an old scary lady with an ax or knife, pursuing you to kill you, well you are totally right, that is the case in this Horror game among my Best Android Horror Games. This can be one of the scariest horror games yet, the fact that an old woman is after she is scary enough picturing it, let alone playing that scenario on your Android device. Your main objective is to carefully and quietly escape from the house that you been locked in. Granny got you locked up in her house, you can try to hide, but not for long, any sudden noise, creaking of the door or dropping something on the floor mistakenly will without doubt alert Granny to come running to check it out and catch you. So do all you can to hide and wait for the right time to escape undetected, you have just 5 days to do so. This game is 66mb in the installation size. Are you ready to get scared by this game? Nah!!! I’m just messing with you, you won’t be that scared, Forest 2 might be a very horror game for Android but, very adventurous. The adventure completely takes out the scary part, you won’t even get scared anymore. This particular version of Forest 2 from the previous version Forest 1, has really improved in graphics and advanced gameplay. Your objective is simple, hunt down and kill the evil ghost that always appears in white with a very long and really dark hair. The mission throughout this game is to go hunting, until you find and successfully banish the ghost. You will be haunted constantly by this ghost, she won’t give you a breathing space to even figure out a way to kill her, but if you stick to the strategy, you might find yourself finishing this fun game sooner than later. This game is just 58mb in the installation size. So, after taking a look at all the Best Android Horror Games I have to offer, I’m sure you’re picking more than one to download, but at least one is enough. My list is just to help you select the Horror game you prefer, you can choose to install all of them and uninstall the ones you don’t find interesting or meeting your taste. Thank you so much for sticking around till the end, till when next I have more tech related articles for you, but for now, bye.